An Under the Sea party will take you swimming with mermaids, diving to underwater "caves" and riding on octopuses. 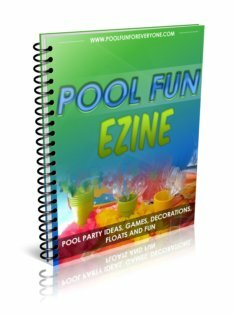 Pool party themes help give direction to your invitations, decorations, food, games and party bags. The decorations and games can be adjusted so that they appeal to all different ages. My granddaughters loved helping me make these fish party decorations made out of paper plates. We painted them blue, cut out the mouths, stapled two plates together, and then stapled in deep blue and aqua blue tissue paper that were cut into strips. Place the fish in lots of different places. We hung these "tropical fish" from the patio umbrella that is also decorated with aqua blue shimmery netting. 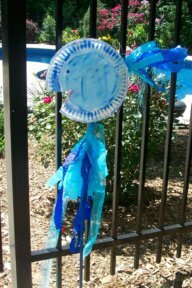 Our painted tropical fish were put on blue painted dowels and set on either side of the pool gate welcoming the pool party guests as well. 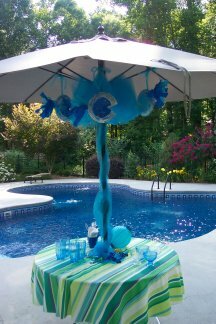 Under the Sea party decorations bring color, fun and sparkle to your swimming pool party. 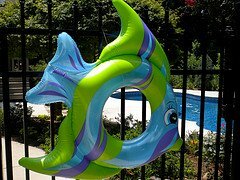 Small and large inflatable fish made for perfect Under the Sea party decorations in and out of the pool. 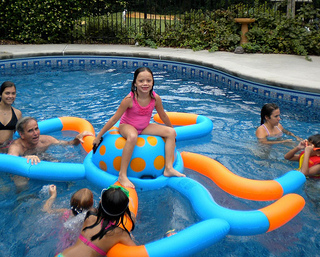 Start with an inflatable fish swim ring tied to your pool gate to greet your guests. Get extra ones for floating in the pool as decorations and for your Under the Sea games. Use bubble machines to create a stream of bubbles the kids have to pass through as they enter their under the sea adventure. Then move it to the pool area. After purchasing at least 5 different bubble machines, I finally found one that worked well and consistently produced lots of bubbles - I'm not sure if it was the combination of the Pro Bubble Juice and the Creative Motion Bubble Machine but the kids loved it. 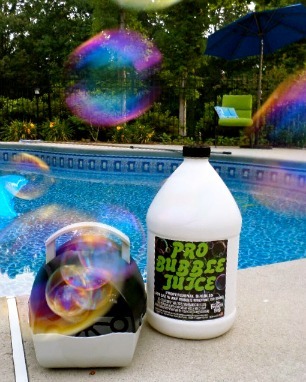 I set the bubble machine on the edge of the pool so the bubbles floated over the water. 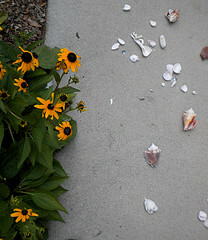 Scatter sea shells on the sidewalk leading to the pool. Or you can also scatter foam sea shells or under the sea foam stickers. Our little ones loved gathering their foam under the sea creatures as they walked to the pool. Extra stickers make great party favors. My granddaughters helped by painting the paper plates blue using little sponges. Blue rhinestone stickers make the eyes sparkle. Strips of different color blue tissue paper and some left over shimmering Easter grass were stapled on as the tail. 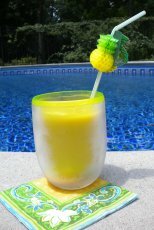 Punch a hole on the top and use aqua blue ribbon to tie the fish to the pool gate, the arbor or on the ribs of your pool umbrella. 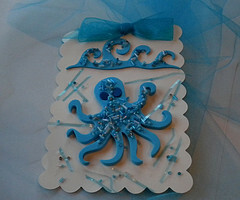 These can be done ahead of time or set up as one of the Under the Sea crafts for the party guests. Shimmering aqua blue netting was purchased at Hobby Lobby. The netting was draped up and around the umbrella ribs and then wrapped around the umbrella pole. The extra netting was pooled onto the table. 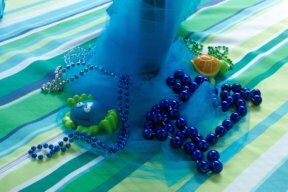 Use inexpensive colorful beads and under the sea creatures like tropical fish and crabs to place on top of the netting. Don't forget to decorate the swimming pool! I always have something floating in the pool - whether it's a pool fountain or inflatable flip flops. These fish beach balls are perfect for an Under the Sea party. 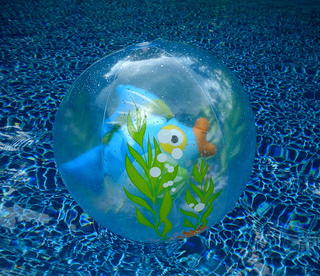 Have several of them floating in the pool when the guests arrive and then let them take one home as a party favor. I found this 24" beach ball at Target. But you can also get a dozen of sea creature beach balls from Amazon. The beach balls in this set of a dozen are smaller at 14". These inflatable sea creatures come in a pack of 12 - four of each animal - octopus, sea horse and fish. I love inflatables for pool parties. 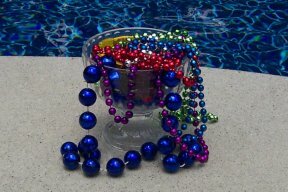 Decorate with them by placing them by the pool entrance or in a spot for a photo op with the party guests. Use them in the pool for pool decorations and then for swimming pool games. Since they come in a pack of 12 send each of the kids home with one as a party favor. 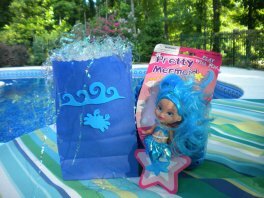 Under the Sea party supplies can be store bought or with a little imagination can be made by you and your kids. Here are a couple of ideas for you. Foam octopus sticker and a wave embellish a plain white stock card. Glue a couple of pieces of sparkly Easter grass and tie a bow on the top for your own custom invite. 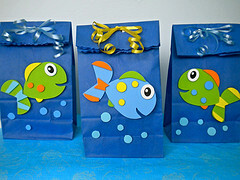 I bought several fish foam crafts and used them to make the invitations and for decorating the party bags. I love the bright, solid colors. Inexpensive blue lunch bags from Target decorated with a fish foam craft are colorful and easy enough that your kids can help make them. Trim the top of the lunch bag with a decorative scissor and fold over. Punch two holes in the folded over top and tie up some colorful ribbon. We placed them around the umbrella pole on the party tables for centerpieces as well. These deep sea party bags were made with blue lunch bags that I found at Target. Trim the top of the bag with a decorative scissor and stick some ocean themed foam stickers on the front. It's easy to find inexpensive favors in the beginning of the summer but by mid-July most of them are gone. I bought the last 5 of these mermaids at the Dollar store for the girls party bags and found some fun, tropical pool fish for the boys. Fish straws and Little Mermaid and fish stickers completed the bags. Everyone of our kids pool parties has included temporary tattoos. Set up a station with an adult, a plastic bowl of water, a washcloth and some tattoos. 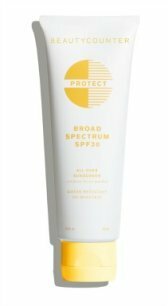 Remove the protective clear film then press the tattoo on the arm with a wet wash cloth. Voila - the tattoo is transferred to the skin. Surprisingly they are quite long lasting and stay on even when the kids are in the pool. Kids and adults love them. Go to Amazon to get a set of 72 for under $5. Under the Sea pool party games include the Trinket Dive, Swimming with Sharks, and a Mermaid Rescue. Pool games for kids need to match the age and the ability of the child. Most games can be adapted so that the games are fun and yet a bit challenging. Always have plenty of adult supervision. Kids love the challenge of swimming through these Under the Sea Hoops to find lost treasure or to gather up sea creatures. The set comes with two hoops that are weighted so they sit on the pool bottom. Put them at a depth and distance that is comfortable for your swimmers. 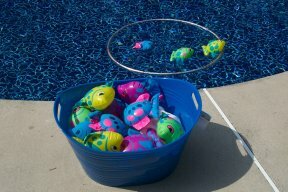 Place colorful plastic necklaces or sea creature dive toys near the hoops or at the end of the two hoops. See how many trinkets they can gather in one breath. For younger kids let them each take a turn and take as many breaths as they want. These hoops have been the biggest hit of the summer. We keep the hoops in our pool all summer for the kids just to enjoy during pool play time. Bubba The Bottom Feeder has been "eating" lots of fish on the bottom of our pool. If you are looking for diving games for your Under the Sea party this is a fun one. Each guest takes a turn "feeding" Bubba who is sitting on the bottom of the pool. See how many fish it takes to make him rise to the top. Just let the kids each take a turn and have fun with it - with no real winners or losers. One at a time have each player gather the dive toys in one breath. How about diving for seahorses that sit upright on the bottom of the pool? Search for sea horses, squids and more with colorful Under the Sea Dive Sticks. Depending on the swimming ability of the guests put them at a depth and distance that is comfortable for them. 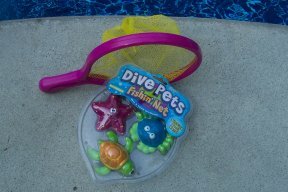 The net that comes with these dive toys makes it easier to gather more than two toys. We threw many trinkets and coins to the bottom of the pool - spacing them at distances that work for the kids swimming abilities. Things like - plastic necklaces, bracelets, coins and small toys become sunken treasure. The kids took turns gathering as much treasure as they could in one breath. Depending on the cost and the number of guests, let each swimmer take home their own "treasures." For kids that are not quite as adventurous in the pool, come up with some Under the Sea games on the pool deck. This game provides a fun alternative. 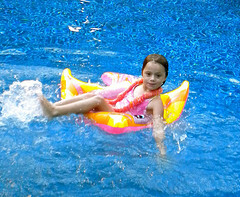 With a hula-hoop floating in the pool, one at a time have the kids throw the mini-inflatable fish into the circle. The child who gets the most fish in the circle is the winner. The kids at our party were too small for winners or losers, but each one had fun throwing the fish. mini-inflatable fish Each player gets a turn to rescue her without being "bitten" (getting touched by one of the floating fishes). Both boys and girls loved playing this game at our Under the Sea party. 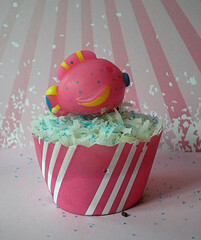 Make fun cupcakes for your Under the Sea cake. 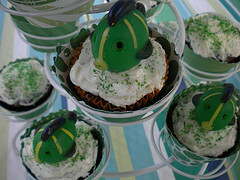 Colorful cupcake wrappers add color and design, while playful fish add to the themed pool party. You don't have to be a cook extraordinaire to make these fun cupcakes. Bright green cupcake wrappers lots of color while the colorful playful fish squirts bring an element of fun. The kids love cupcakes topped with toys that they can actually take home and play with. Because they are plastic they can go in the pool too. These fun cupcakes are topped with some fresh coconut and sprinkled with some blue colored sugar. The wrappers provide so much more color than cupcake liners. Even the more expensive liners fade and lose their color after they've been baked. Cupcakes are easy to make, easy to decorate and an easy to serve dessert for any kids pool party.